My birthday celebration this year began the night before. Alfonso Cevola, a friend and fellow blogger “On the Wine Trail in Italy,” was visiting from Texas and we met at La Pizza Fresca for dinner. We had two wines. I was given this bottle of Sciac-trà from Liguria for my birthday. It was one of the most interesting rosato wines I have ever tasted. 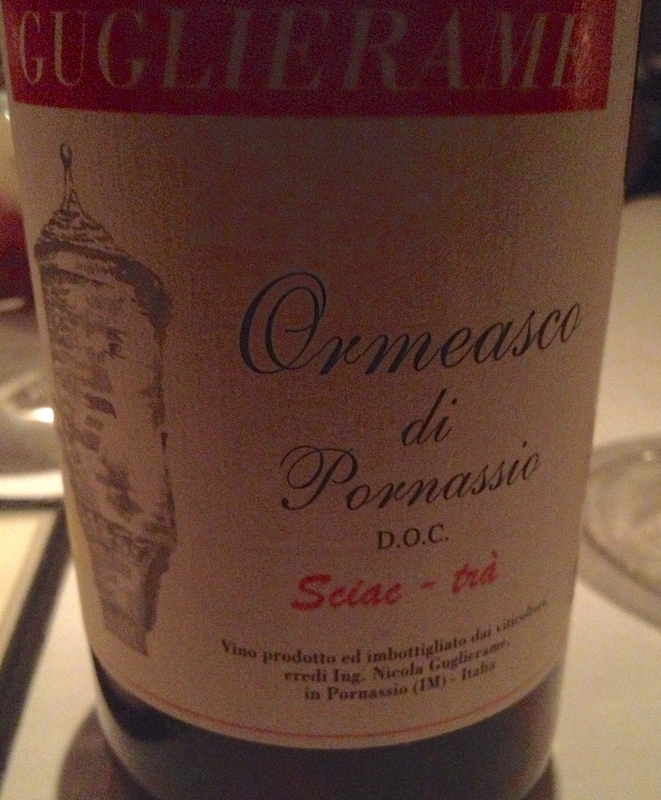 It is made from the Ormeasco grape, which is the local name for the Dolcetto grape. It is vinified in the traditional way. The wine must be produced from at least 95% Ormaeasco and 5% of other approved red grapes. The grapes are grown on steep slopes high in the mountains at 800 meters. This grape is an early ripener and I believe the name means “crushed before the others.” It is aged for 4 months and does not see any oak. The wine comes from the Rivieradi Ponente in northwestern Liguria and should not be mistaken for the sweet Sciacchetra from the Cinque Terra area of Liguria. It has lively fresh red fruit flavors, a nice finish and a pleasing aftertaste. The other wine of the evening was my favorite Chianti, Chianti Rufina Riserva 1990 Villa di Vetrice. The wine is made from 100% Sangiovese and there is traditional vinification. 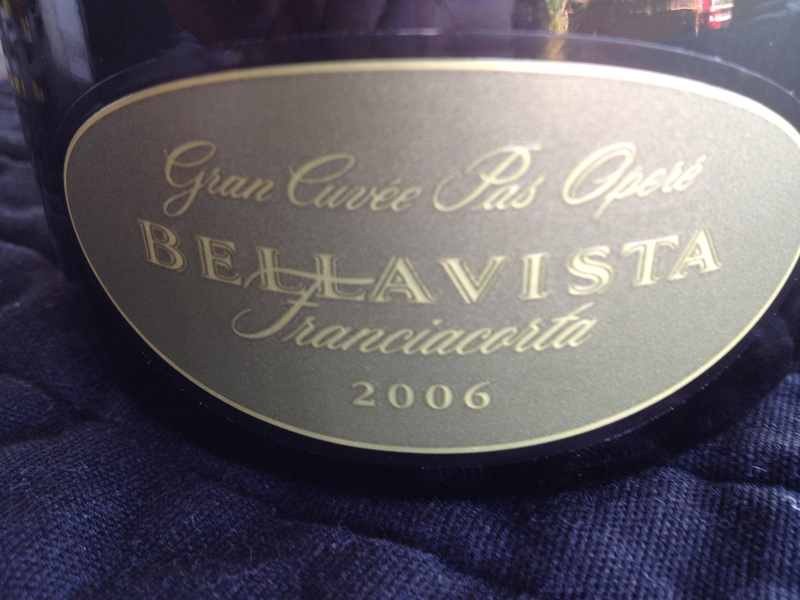 The wine is aged in large botti–oak barrels between 45 and 60 HL. The wine was showing no signs of age and will last for a number of years. It is Chianti at its best! For my birthday dinner, I asked Michele to make some of my favorite food. 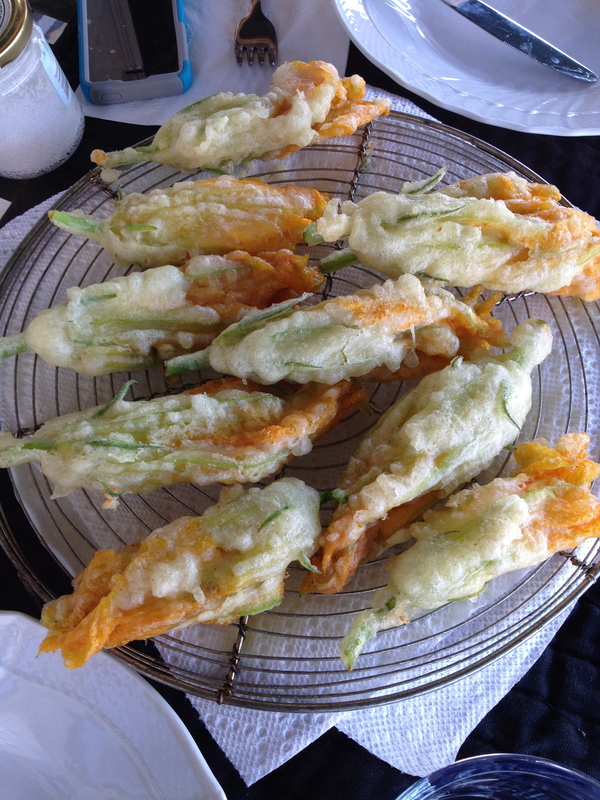 When I am in Rome the first I do is head for a restaurant that makes fried zucchini flowers stuffed with mozzarella and anchovies. I love them. Since I am not in Rome, Michele and I went to the Greenmarket in Union Square and brought a box containing a dozen zucchini flowers. When we returned home Michele wanted to know how many she should make and I said all of them. When in Rome I drink Prosecco with the flowers but Alfonso had given me a bottle of Franciacorta Grand Cru Pas Opere 2006 Bellavista for my birthday so I decided to try that. It is made from 62% Chardonnay and 38% Pinot Noir. The vineyards are on high hills facing south and southeast and the average age of the vines is 20 years. The wine is aged for 6 years in the cellars and it sees some small oak barrels. The wine is big and round with nice fruit flavors and good bubbles. For the next course, Michele made my favorite pasta, bucatini all’Amatriciana, thick tubular pasta strands with a tomato sauce with guanciale or pancetta, and pecorino cheese. 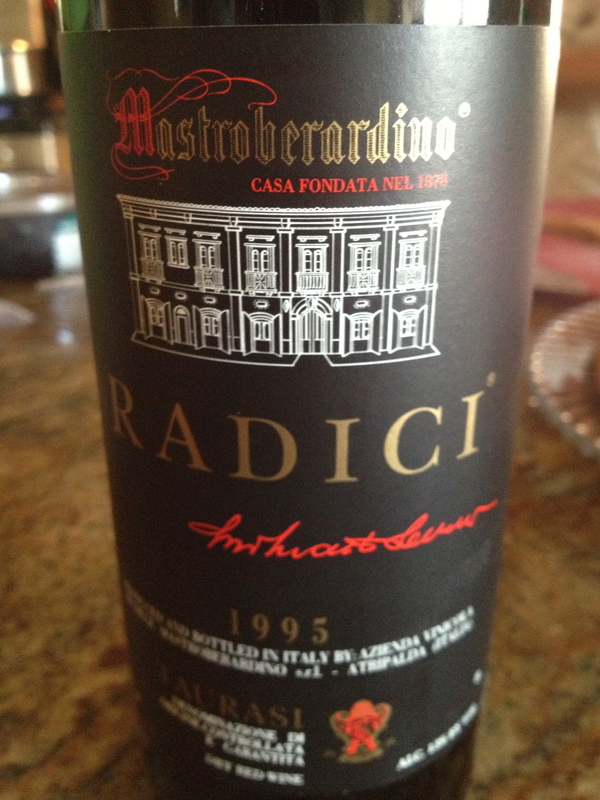 With it we drank Taurasi “Radici “1995 Mastroberardino DOCG, 100% Aglianico grapes. The vineyards were on two hills, Mirabella vineyard at 500 meters and the Montemarano vineyard at 550 meters. Because of its position on the hill and its altitude the temperature at the Montemarano vineyard was much colder and the grapes are picked a little later. Harvest takes place from the end of October into the beginning of November. The vinification is the classic one for red wine, long maceration with skin contact at controlled temperatures. The wine is aged for 24 months in Slovenian oak barrels and remains in the bottle for 24 months before release. This is full, complex wine with hints of black cherry, plum, spice and a touch of leather. Foe dessert there was a blueberry crostata! Happy Birthday, Charles! may you continue eating and drinking this well per cent’anni! It’s been a White since we last met. I hope you are well. 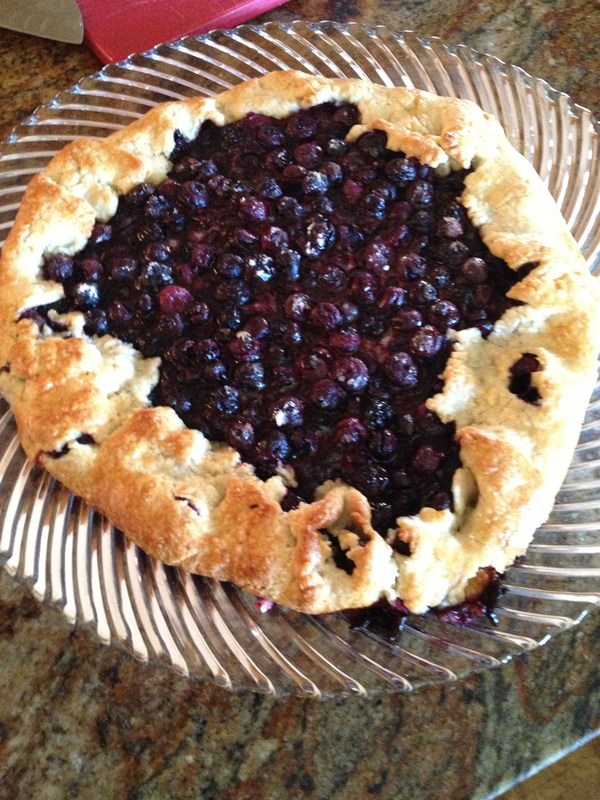 Can Michele make the crostata again when we re-celebrate Rob’s and yours birthday?!! wow, Michele’s food looked great – you are such a lucky man- and very deserving of all the luck that has come your way…cheers! Happy Birthday. Looks like you had an appropriate feast.